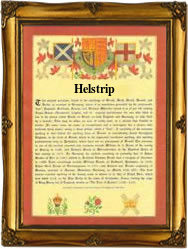 Recorded as Helstrap, Helstrep, Helstrip, Helstrop, and possibly others, this is a very unusual surname. Widely recorded in the county of Yorkshire, we believe that it is locational from a place called Helslack in the county of Northumberland. Certainly there is no other place in the British Isles with a spelling anywhere near the same spelling as this surname. Curiously the famous Oxford 'Dictionary of English Place Names' seems to have overlooked it. From research we know that a lookout tower existed near to the village from the days four centuries ago, when a continous war existed between the inhabitants on both sides of the England - Scotland border close by. On this basis the name may translate as 'the watch place on the ridge' from the pre 7th century 'hal cop'. The surname is not recorded at all in Northumberland, but does appear in the surviving registers of the city of London with that of Robert Helstrap at Sunbury on Thames, on October 7th 1791. In Yorkshire recordings include William Helstrep of Hutton Bushel on October 28th 1728, and Thomas Helstrip at Tadcaster Wesleyan church, on September 15th 1831.